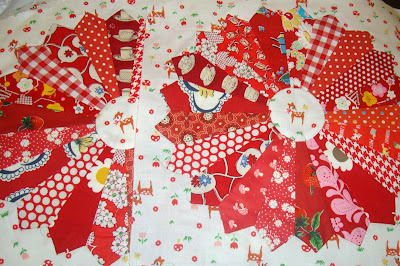 I'm trading my quilter Wendy by making a quilt top in exchange for machine quilting. Here is a little peek at my quilt, "Freda's Flowers". This is the quilt I'll be making for Wendy. 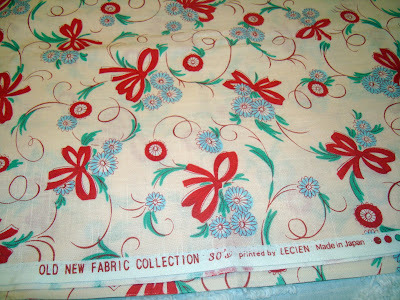 "Freda's Flowers" is jelly roll "friendly" so Wendy chose Chloe's Closet 1933 for her fabric. 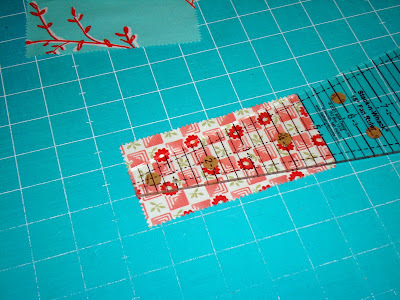 However, the jelly roll doesn't have enough greens or lights to make 30 blocks. So I'm supplementing them with my stash and I hope fabrics I pick compliment/match well enough for Wendy's quilt top. 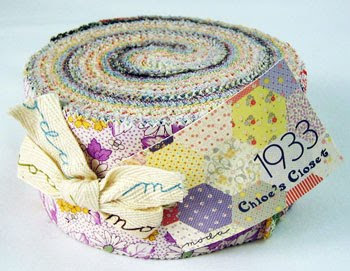 These are the lights from the jelly roll. They are pretty busy so I hope they work out. These are the lights from my stash that I'll use to supplement the jelly roll. These medium and dark value strips from the jelly roll will work great. I won't need to supplement from my stash when using these. 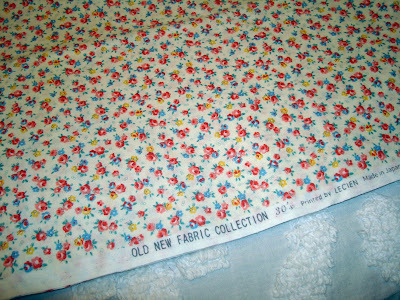 The 1933 darks will be perfect for the flowers. Again, I don't need to supplement here either. 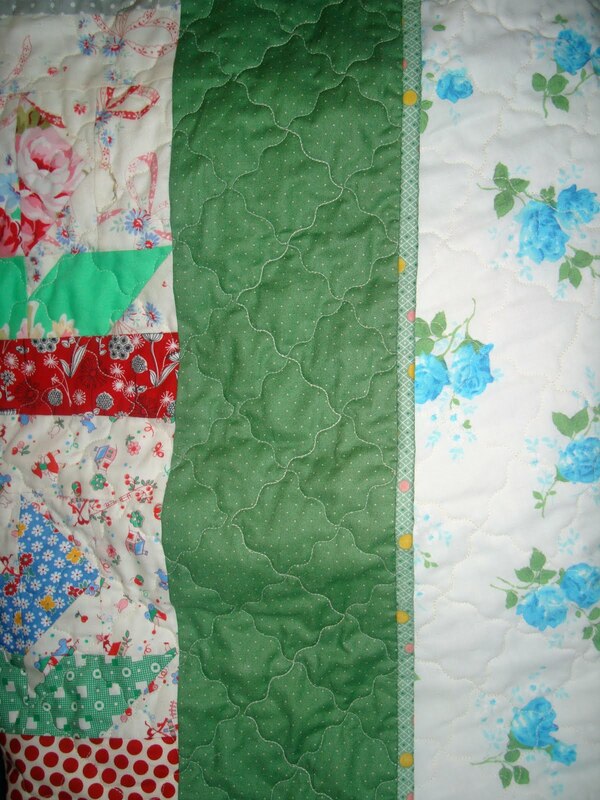 These are the greens in the jelly roll and there aren't nearly enough of these. So I hope my greens above go okay. Ugh. That is a terrible representation of the green. They look rather sick in this photo. It is the greens I'm less confident about. I may have to cut more. I really do like this 1933 line and I had several prints from the group in my stash. 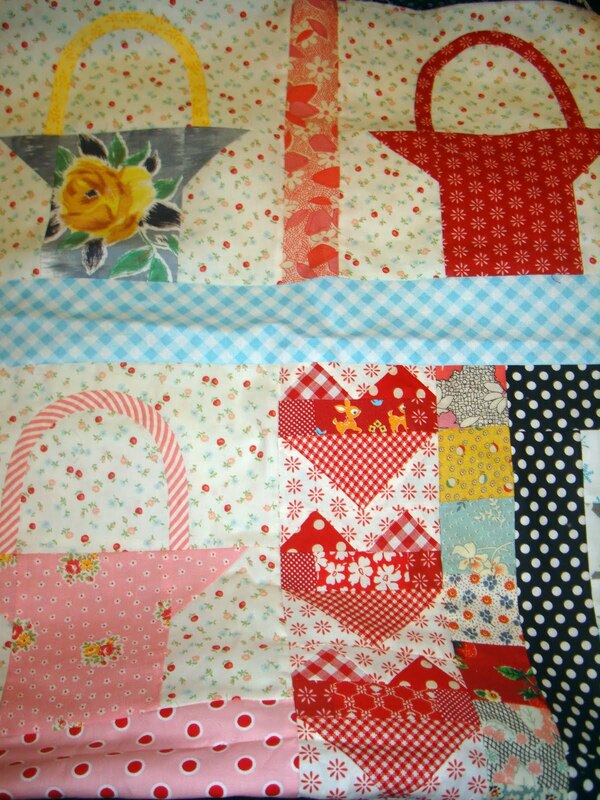 I just hope Wendy likes her flimsy when I'm done. Everyone is doing it. All my friends are all making them. I feel like this is Jr. High and I must must must follow the crowd. Butterflies. Haven't you seen them just everywhere? Every time I see them on a blog I want to make them. 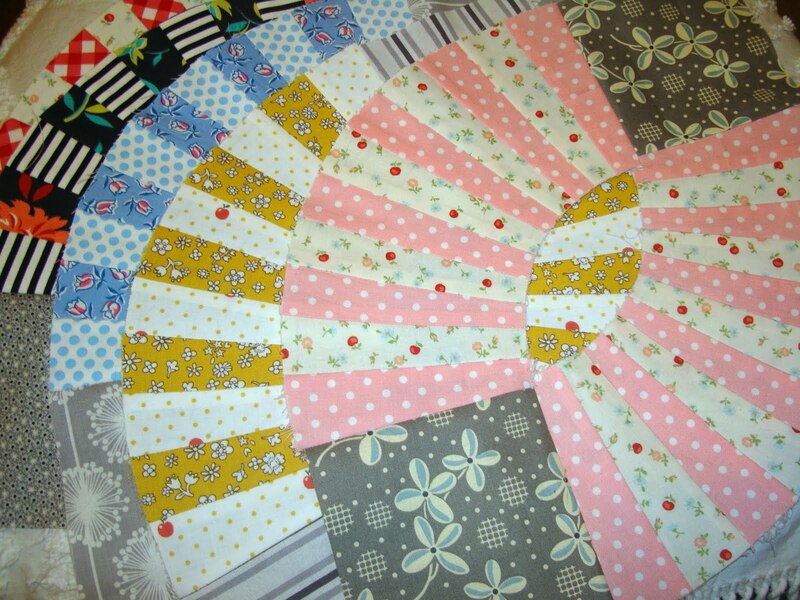 So today I stopped the presses and made 3. I had to do it. You'll see 2 different sizes above. 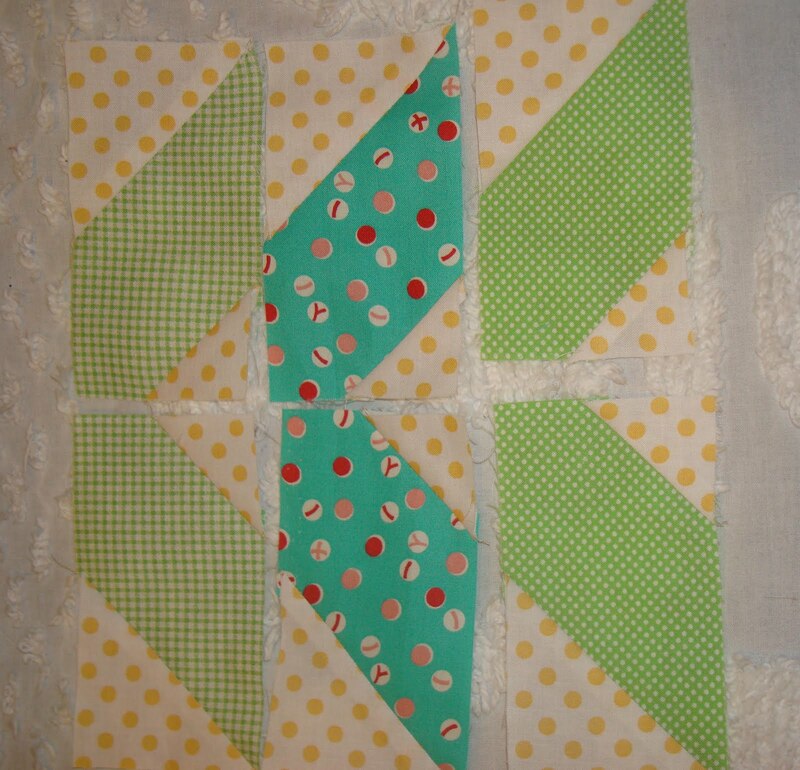 I used the PKM directions for the one on the right with help from Amy's tutorial. 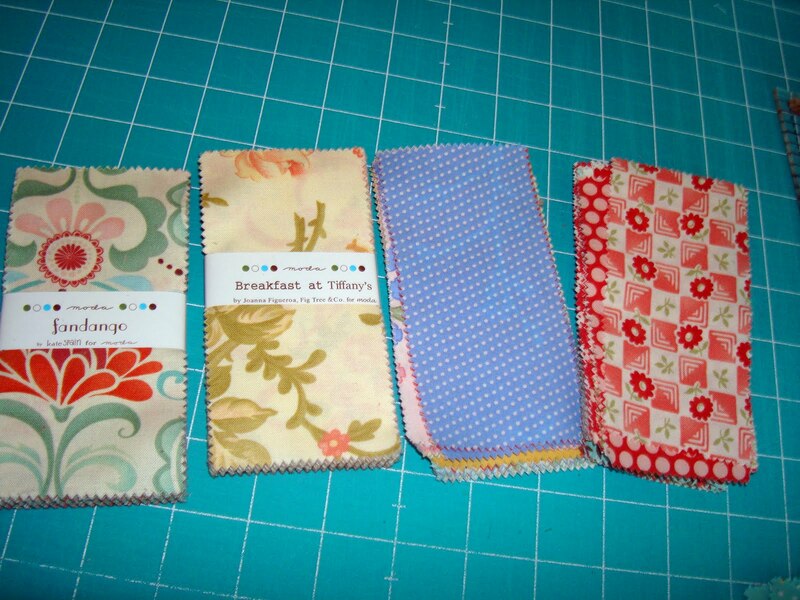 Then the ones on the left I made somewhat in my own size. 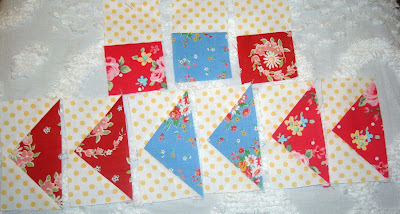 And yes, the are slightly wonky (there, I said it) but they are supposed to be. And they are fun to make. But I can't lose my focus so I only allowed myself to play for so long. I have no idea what I'll do with them. Back to my list of things to do. This is the latest block for the Jelly Roll Sampler. I can't say it was my favorite. 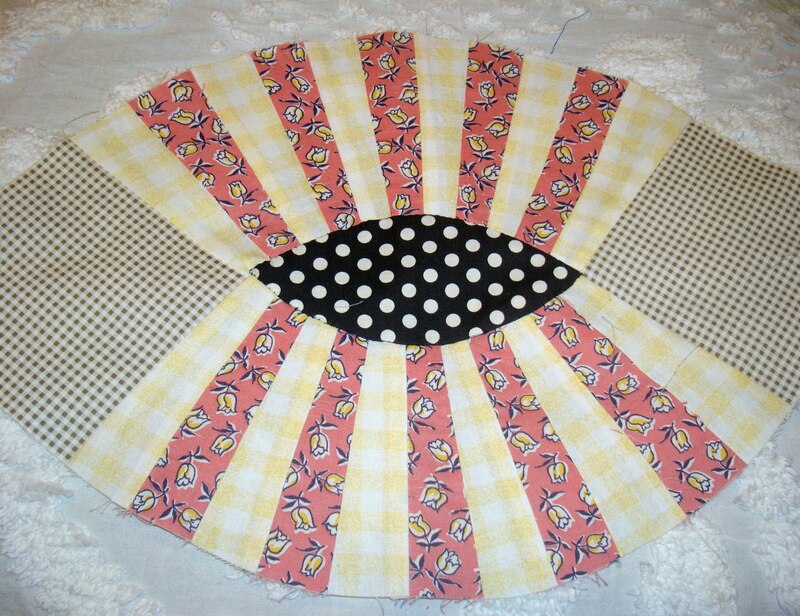 It looks simple but putting it together was dealing with weird seaming. However, it turned out ok. It is slightly off kilter, but it is done. So squint a little when you look at it. Check. And I'm up to date with that project. 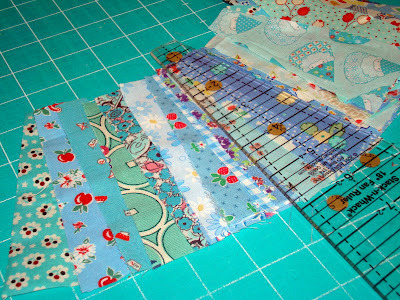 Until I get some heavy duty pattern writing done my blog posts are going to be pretty darn slim. 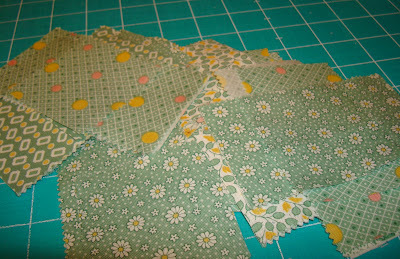 So today I'll show you pretty fabric sewn into pieces and parts of upcoming flowers. Obviously these will be leaves. 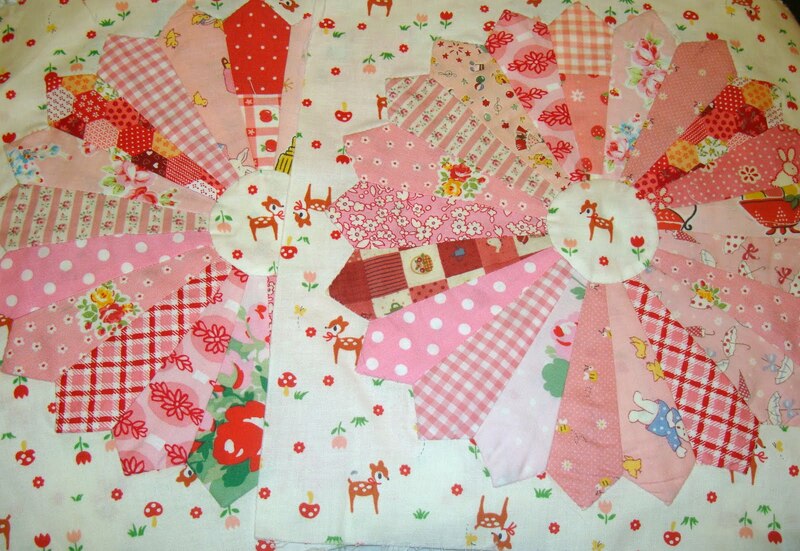 And these little flying geese and 2 patch blocks are parts of flowers. 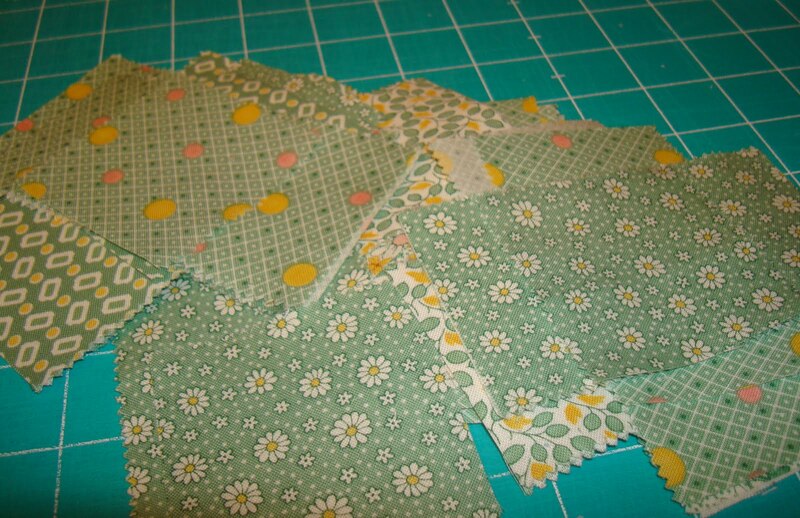 I've used Lecien Dots, Flower Sugar II and some other floral fabrics I've accumulated. It is so fun using these beautiful fabrics. I always like to show progress from the weekend on my Monday posts. Today that is what you get. 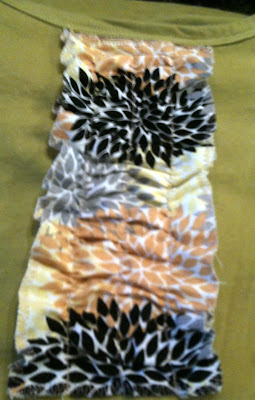 I woke up Friday wanting to embellish a t-shirt. 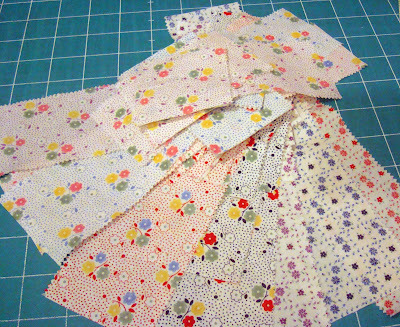 I took a stripof fabric 14" long by 4" wide. 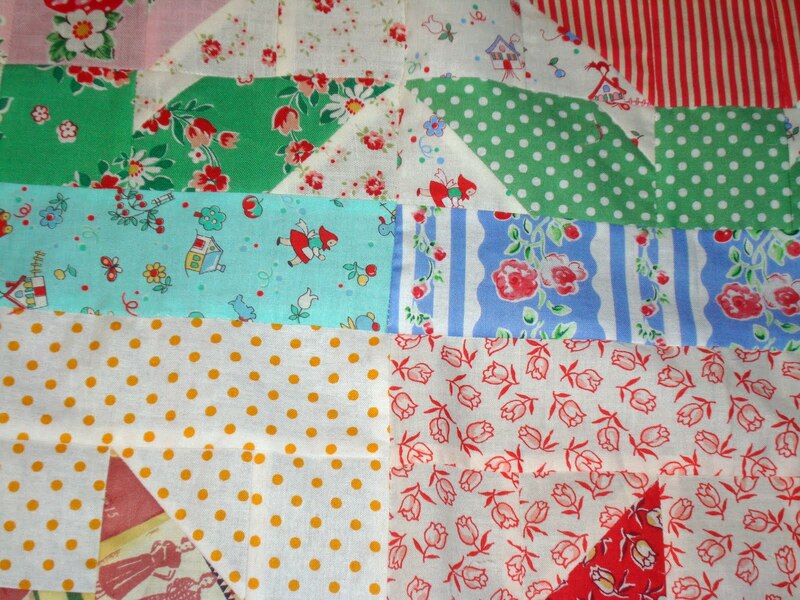 Then I finished the rough edges and made 3 lines of shirring. 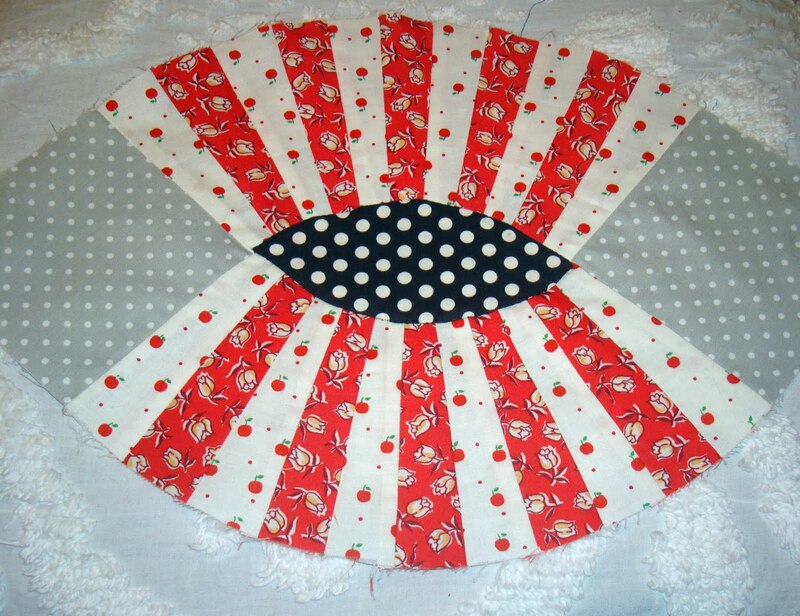 After that I top stitched it onto my t-shirt. The pic is bad because it is from my iphone. It was fun to make. 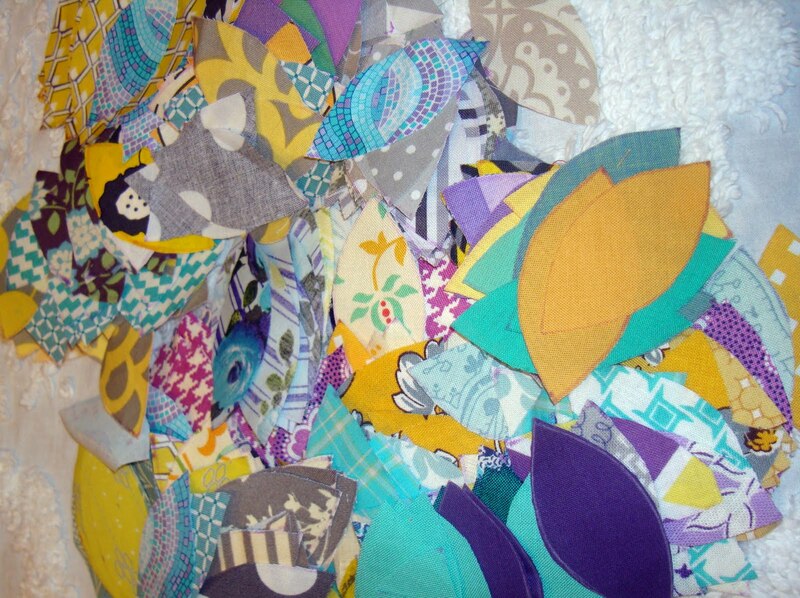 I made more progress on my Butterfly Kisses quilt, which shall here after be known as my Lady GaGa quilt. Lori texted me that they look like Lady GaGa eyes after I referred them as eyes in my post last week. I like the name and it is sticking. Lori is my muse and I love when she names my quilts. 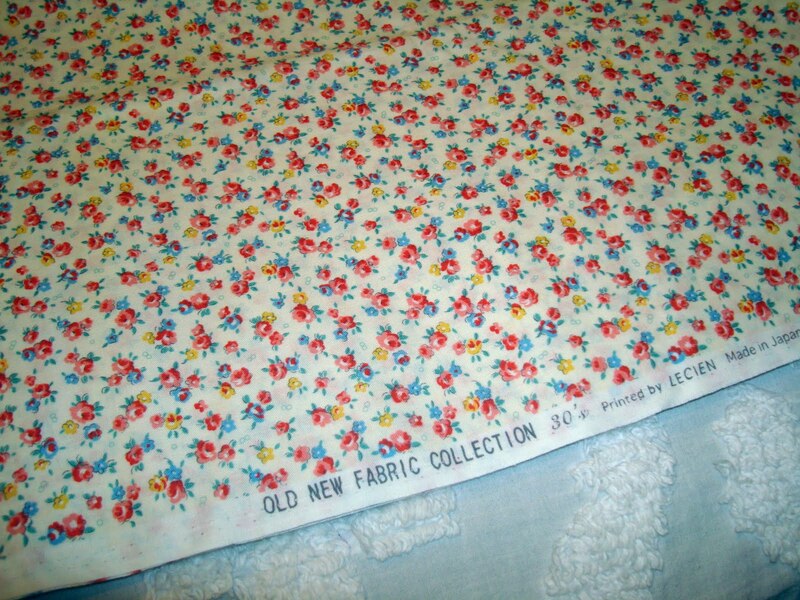 I finished the binding on my new quilt "Freda's Flowers". 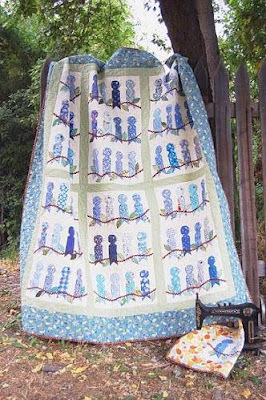 I love the quilting that Wendy of Eagle Mountain Quilting did. She quilted wavy cross hatch. The back of the quilt is a vintage sheet. 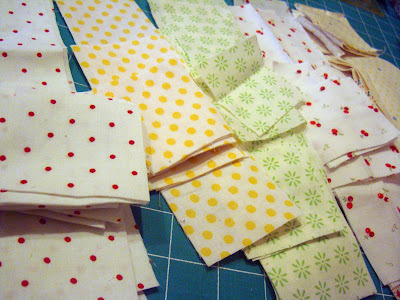 The pattern is coming soon. 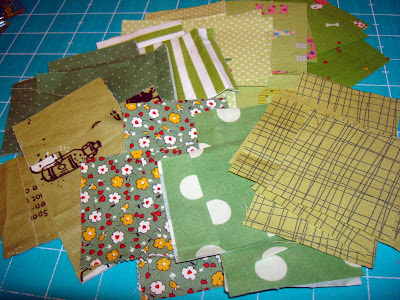 I'm working on my small version sample quilt. 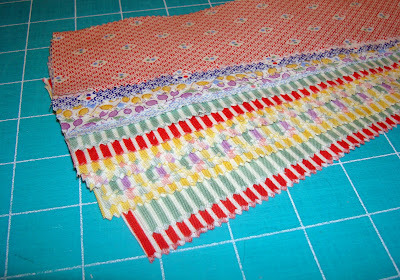 I picked up Wendy's Jelly Roll to make her a quilt top (we are trading quilt top for machine quilting). So I have lots to do! April sent me this beautiful package this week from April's 30's Sewing Shop. 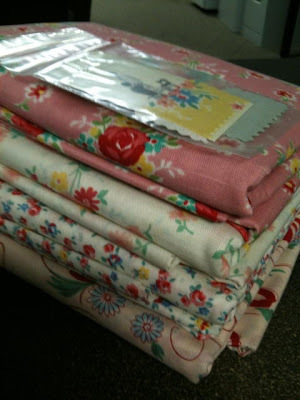 April sells Singer Featherweight machines, accessories and lovely fabrics. Look how great she wrapped my parcel. 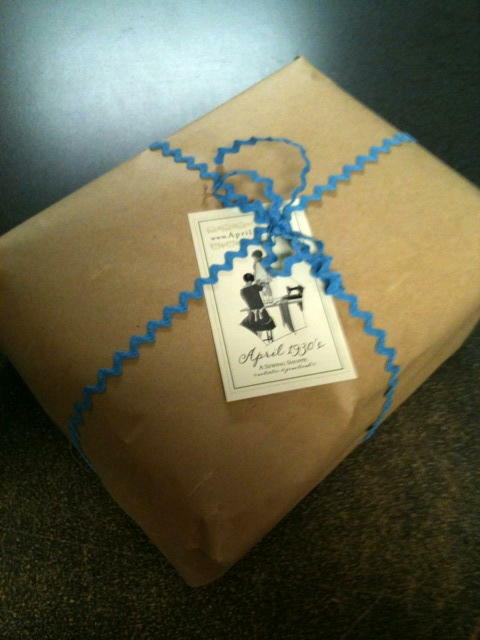 I love the brown paper wrapping, just like if I'd gone back in time and shopped at a vintage mercantile store. 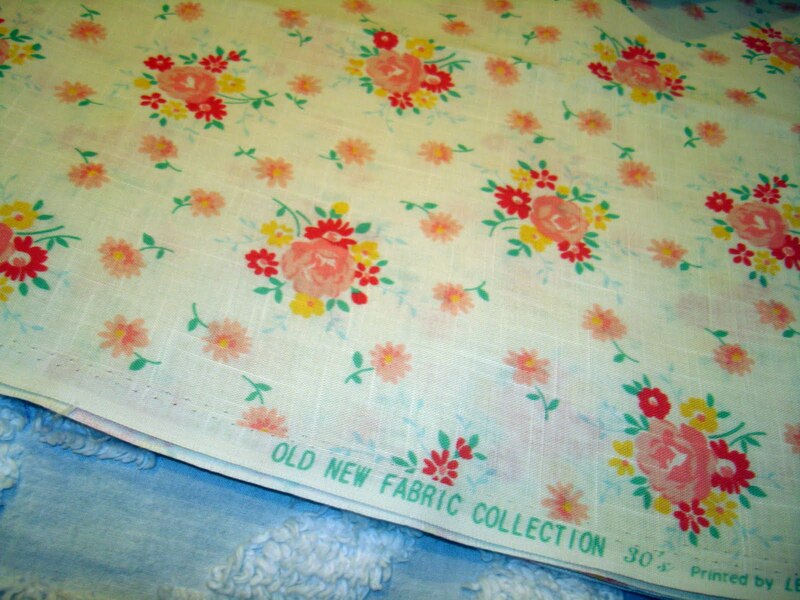 I've been looking high and low for these specific fabrics. 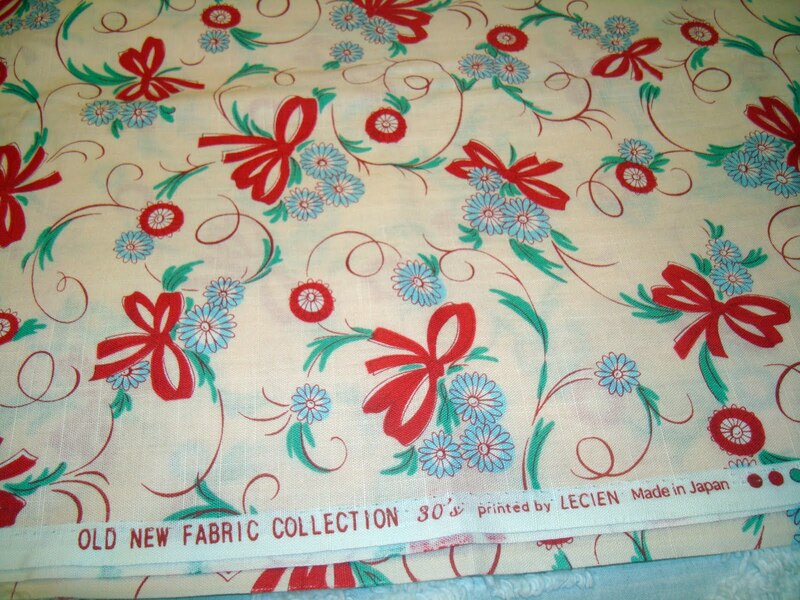 They are kind of the "lost" fabrics from Lecien's New Old fabric line. By lost I mean next to impossible to find. I did have a piece of this particular piece but I have loved working with it so much that I was happy to get more. I have been using it and have plans for designing more with it. Isn't it so pretty in pink, too? 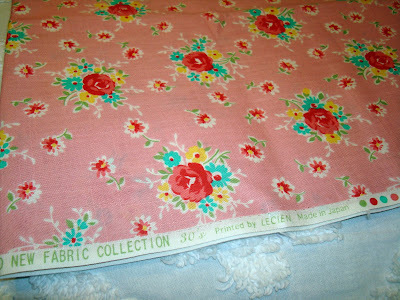 It really is a lovely weight of fabric and very closely resembles authentic feedsack. This piece from the line I have really not seen anywhere in the US. 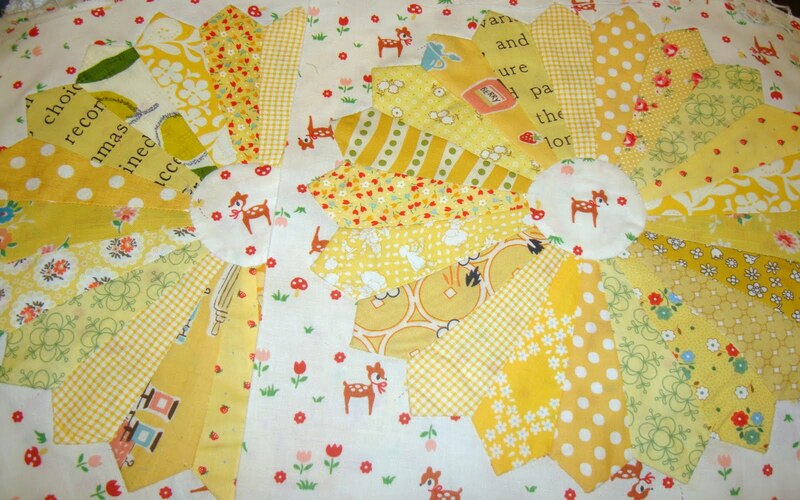 I really love bows and this fabric is so vintage and sweet. This print has been MIA as well. 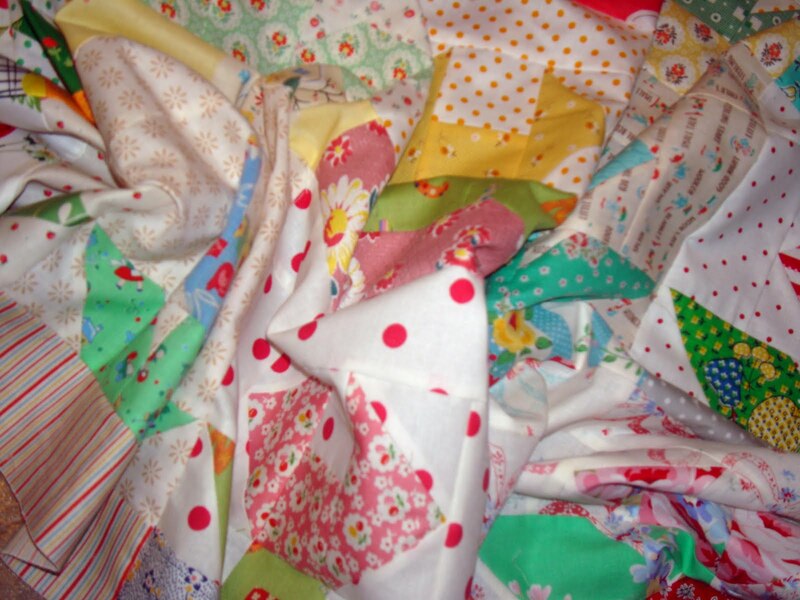 How can you not smile and enjoy these fabrics? I think they are really some of my all time favorites. So while I wait for my "new pattern" quilt to be quilted (Freda's Flowers) and I work on patterns that HAVE to be done (why is writing patterns so boring? ), I'm spending bits and pieces of time on my Gypsy Kisses quilt. 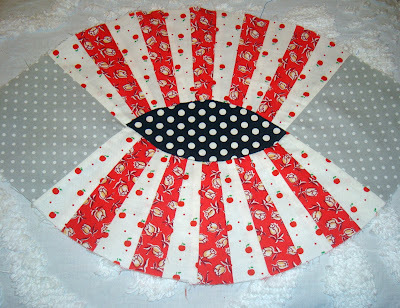 Right now I'm appliqueing the black and white centers to the "eye" blocks. 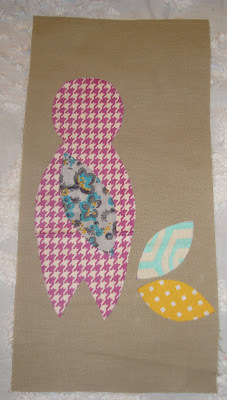 It goes pretty fast but it isn't my favorite applique project. I don't really like it because I'm appliqueing on top of a hole in the block. I tried pinning the black dot and didn't really like that. 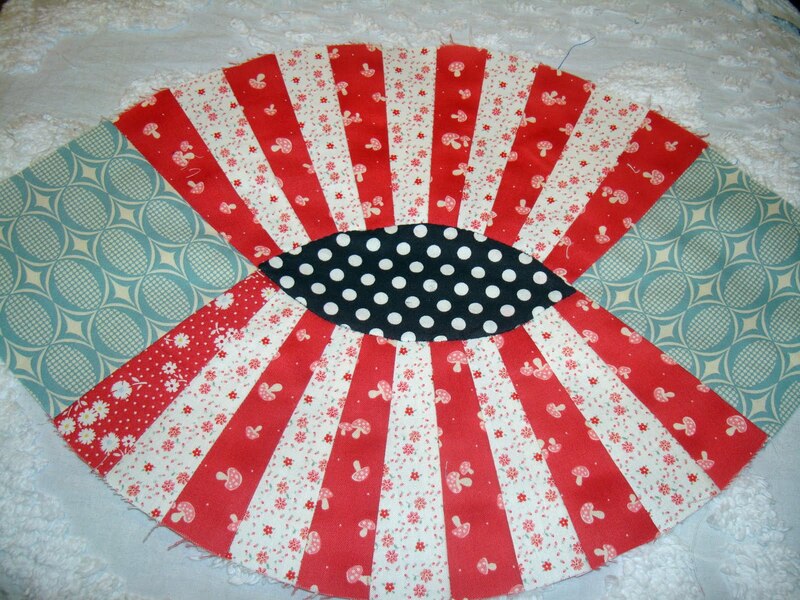 And using applique glue doesn't work well because there is just such a small amount of seam allowance to glue the middle part to and then it is hard to sweep my seam allowance under as I stitch. Anyway, it's okay. I just have to keep on going. 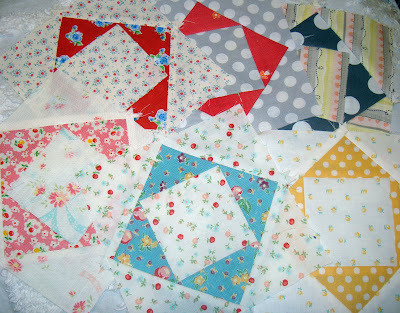 I will also admit this isn't my favorite quilt process (it hasn't been 100% fun) but I love each part when I make progress. And I'm so looking forward to my finished quilt. Eventually. 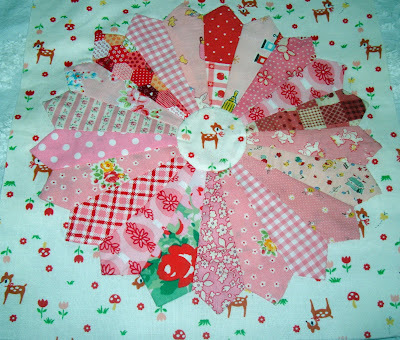 Some of you may remember I'm working on a quilt with my local quilt group. 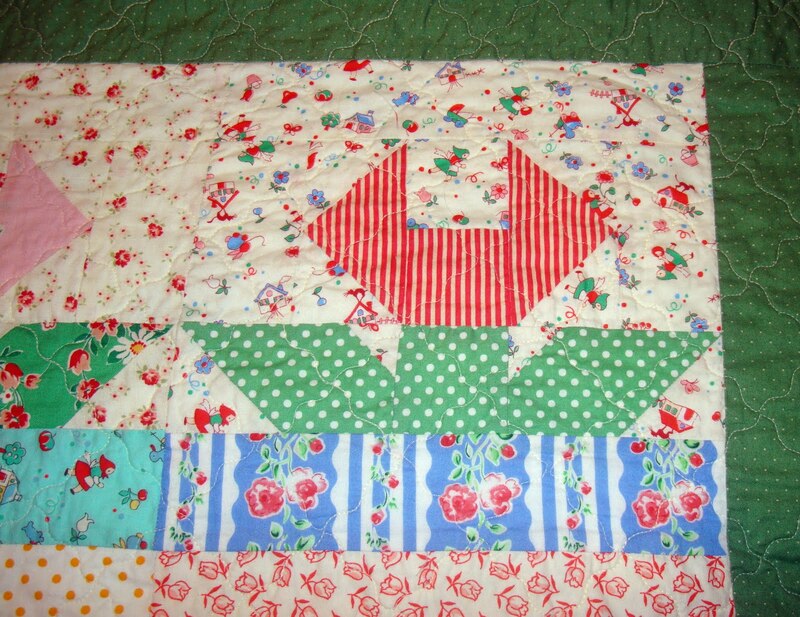 The quilt is designed by Jina Barney and is a block a month project. Jina has the instructions for the blocks on her website and anyone is welcome to join us in making this fun quilt. Here is snippet the quilt so far. I am really excited to be up caught up to date with my blocks in time for the August block to be revealed at the end of the month. However, instead of Jina's flower blocks for May. I opted instead to make Dresden plates just because I was wanting to make them so much and the size of the block could be adapted to a Dresden. Here are my reds. And my pink blocks. Dresdens are always really fun to make. 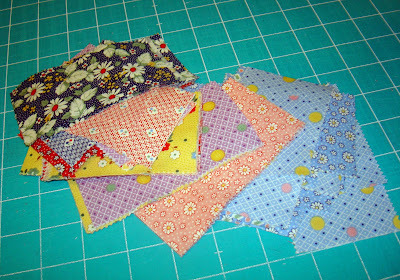 I need to attach them now to the progress on the quilt. 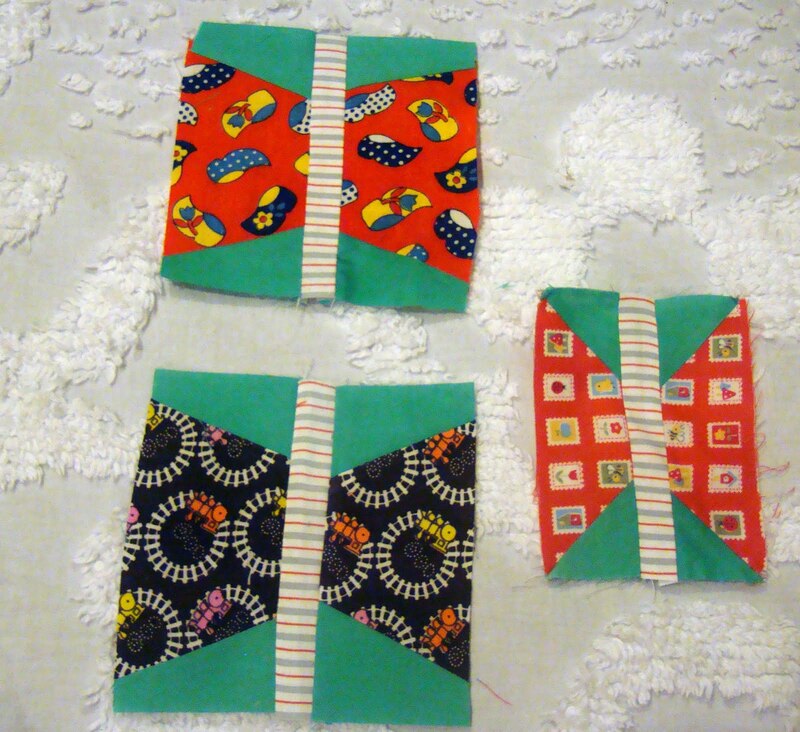 These are June's block - economy blocks. 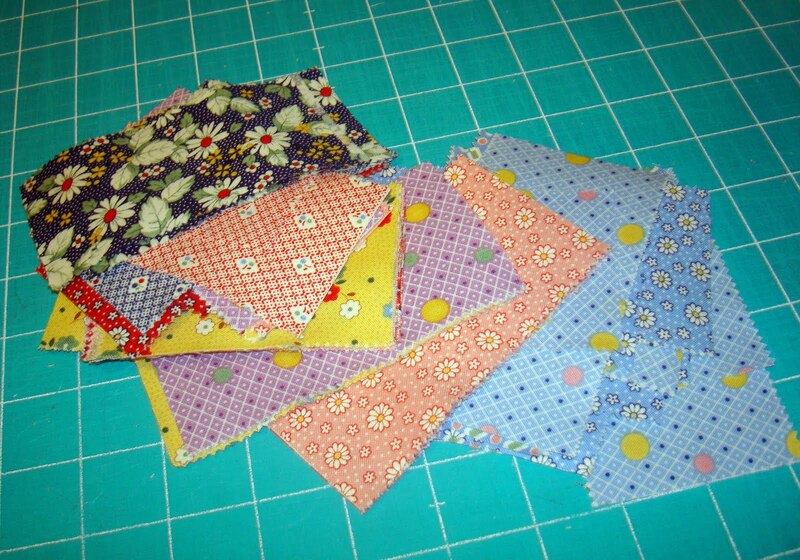 Jina will add these to the quilt a bit later so for now I'm setting them aside. The same is with the July stars. These will be sewn in later. It feels really good to be current. I've managed to keep up with my projects this year. That isn't to say I've kept my New Years resolution . . . but that is another story for another day. Oh my what a hot busy weekend. Trying to cram several days into Saturday doesn't really work, especially when the weather is this draining. I hope you all had a nice weekend though. I can show you 3 good things today from my weekend. 1. 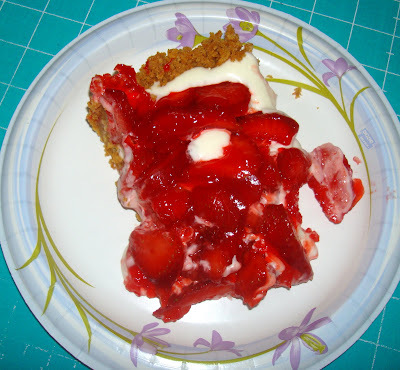 Lori's cream cheese strawberry pie: Holy Wow. Actually this would rate a 5 out of 5 wowies. You can see Lori's recipe/tutorial for it here. I highly recommend it. It was easy, too. My girls helped me make this before church Sunday. My in-laws came for dinner and we had it for dessert. Thanks for the recipe Lori. 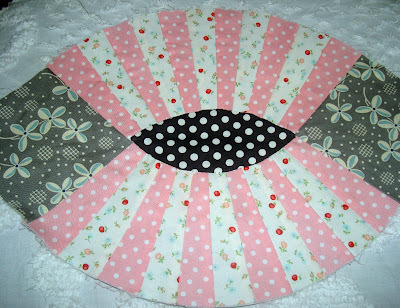 This is one I'll make again and again. 2. Remember the giveaway I had just 2 weeks ago? Well Brandie won first place. Brandie has a really fun blog called ABC. I sent Brandie a kit for making my bag and she made it already! - just over the weekend actually. Thanks for sending me the photo Brandie. Don't you love it when the person that wins a giveaway is happy with what they got? Yep. Brandie is great. 3. I've always loved working with 2 1/2" squares and 2 1/2" strips in my quilts and original designs. This new 2 1/2" x 6" ruler is my new favorite. 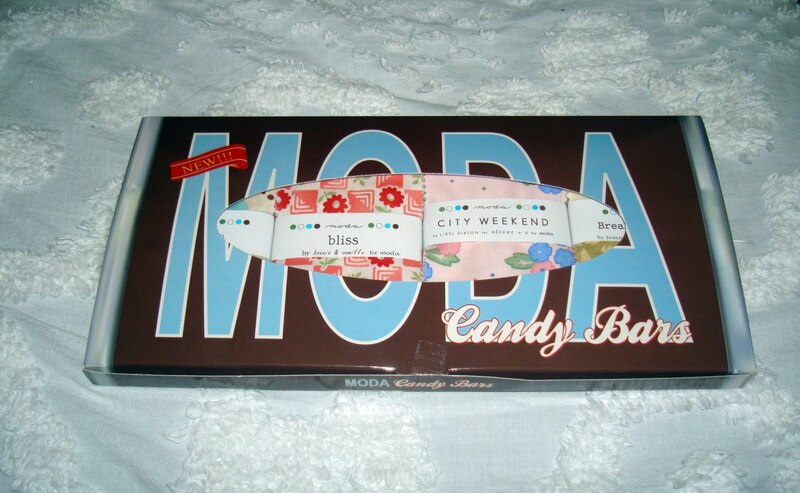 I got it at Erica's online. The price was right and it came with a non-slip back. I absolutely love this size. 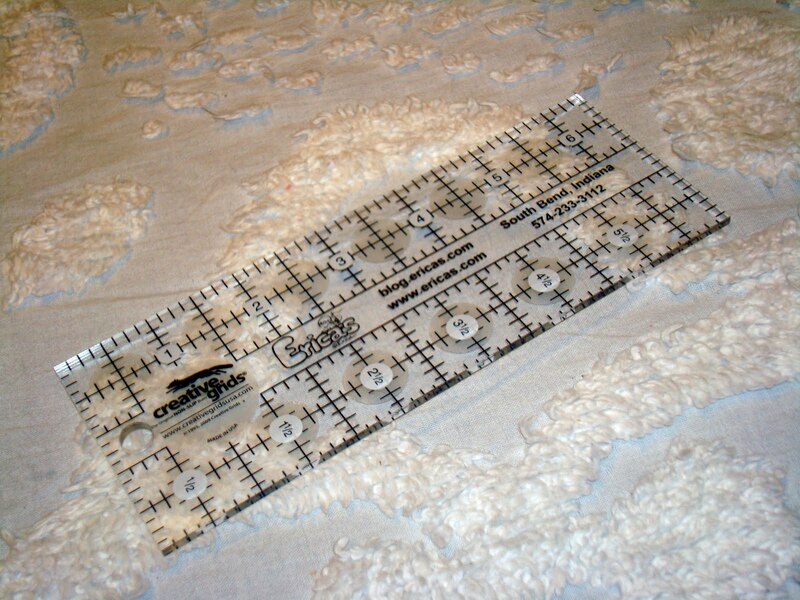 When I unveil my newest quilt design you will understand why my 2 1/2" square, my 2 1/2" long ruler and this new 2 1/2" x 6" were perfect. 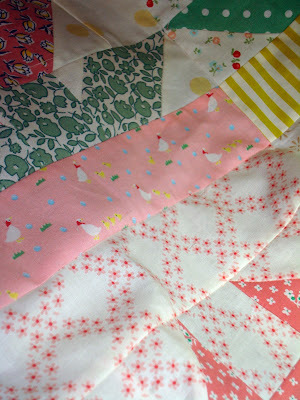 My quilt is at the quilter right now. Wendy, the machine quilter, called me while she was setting the quilt up. 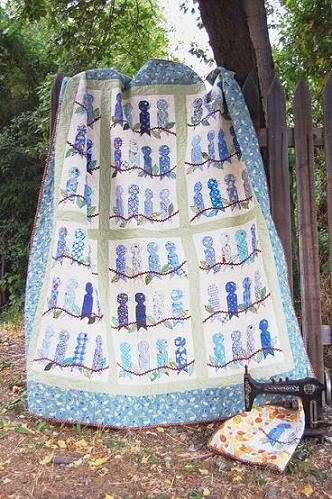 She told me she loved the quilt and asked me for the pattern. I considered that a huge compliment. I hope that is an indication of how much everyone else will like it, too. 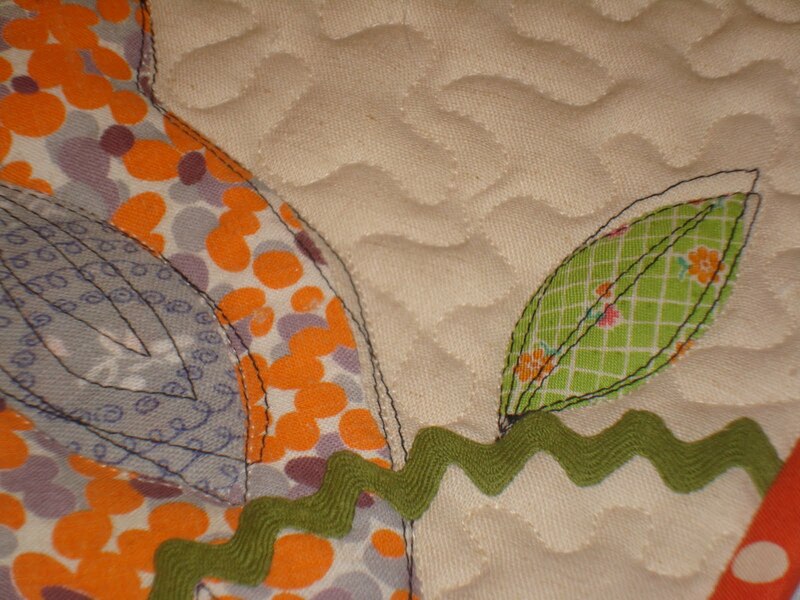 Two years ago I designed this quilt "In the Leafy Treetops". 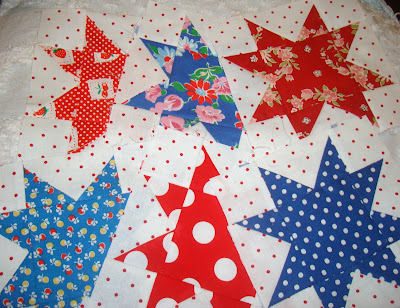 It is my daughter Natalie's favorite quilt of mine and she's been wanting to make her own from quilt from this design. 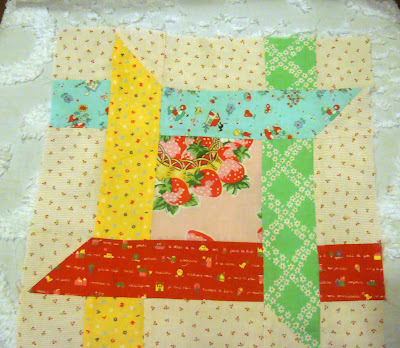 But Natalie really prefers to applique rather than piece, so for her birthday last year she asked me to make her a pattern for an applique bird so she could make her own version of "In the Leafy Treetops". Along with drawing up the pattern for her I made her a potholder block as a sample. I love the plumpness of the birdie. I changed the design up a little bit and added a different fabric to accent his wing. 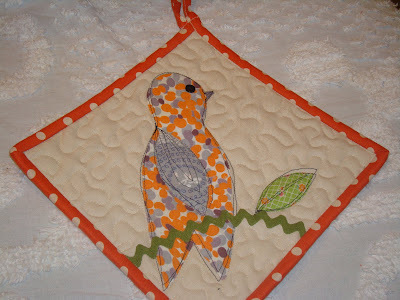 I sketch embroidered it all with my machine and then tightly quilted the background so Mr. Birdie pops. 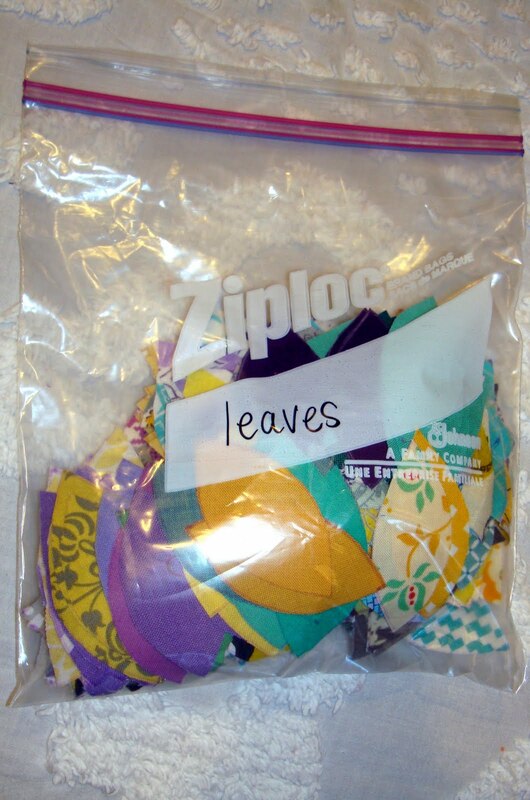 and leaves. You see she's all cut out and ready to go. Hey! 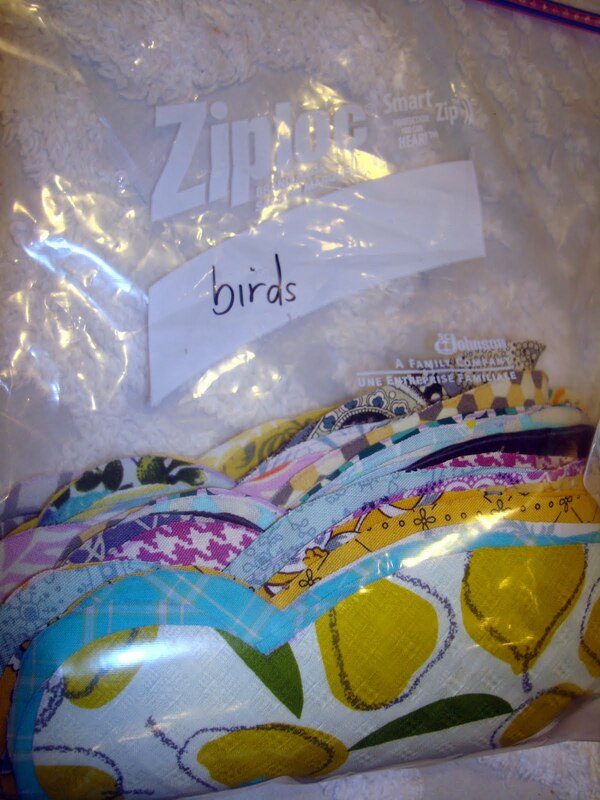 I recognize some of that fabric. Actually I'm happy to share with her. But most everything comes from her own stash. 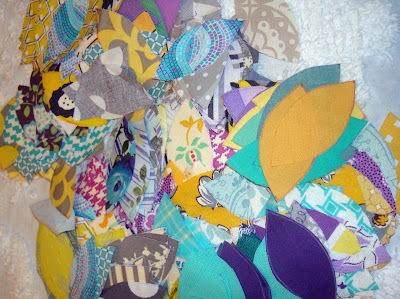 She is using all the same colors/fabrics for each part of the bird/wing and leaf. Very modern. It's going to be really great. 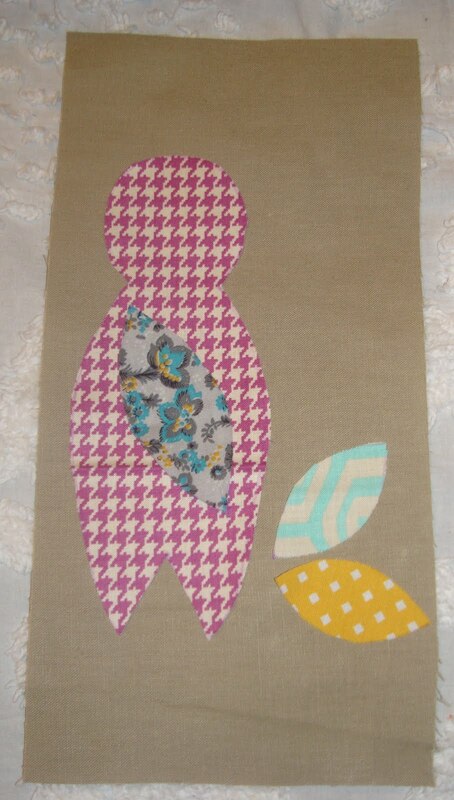 Her background will be various shades of grays/linen colors. She hasn't picked out her rick rack yet. I imagine that will be in similar colors too. I'll keep you posted on her progress. I'm excited to see her take the idea and make it her own. P.S. Today is Mr. Hive's birthday. He really prefers very low key birthdays. 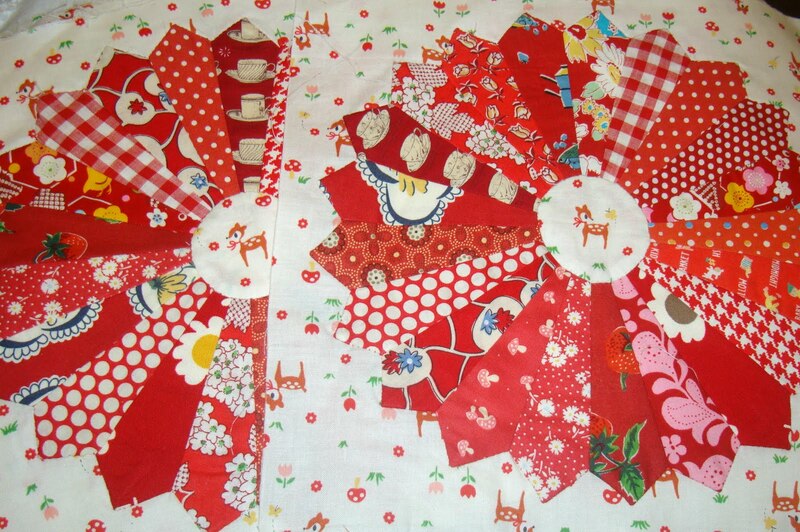 But on Sunday we'll have a family dinner with Lori Holt's Strawberry Pie. Being the youngest of 5 sisters I was the bratty one growing up. So in my typical bratty self I'm posting S.I.C.S. = stuff I can't show. Don't you hate when bloggers do that? Sorry. I do have a love/dislike relationship with teaser posts like this. Especially since I'm the type to want to know the end of a movie before I enter the theater. So here I am teasing you. There, this photo is a little bit less annoying. 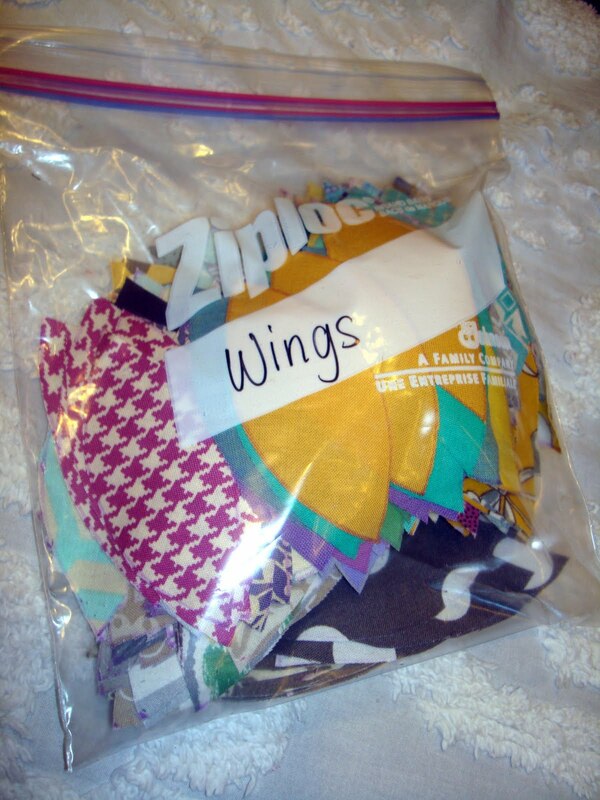 You can see the colors and scrappiness (not a real word but it should be). 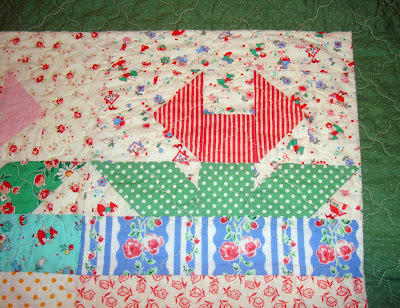 So you know it must be a quilt top I made. Here is just a little more. And look, no cut off points! I wish I could do that for every block every time. 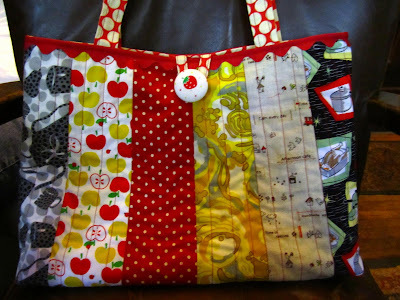 This baby is going to the machine quilter Thursday morning at Broadbent's. Meet me there and I'll show it to you. 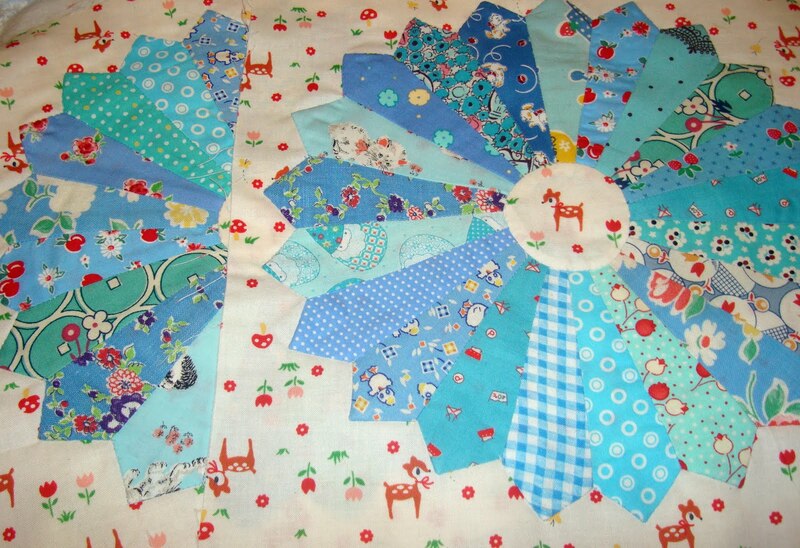 (ha) But you have to promise not to tell what my new quilt/pattern looks like. Some of you may be good at figuring it out.